Bob Katz is a well-known, dedicated, passionate and highly accomplished recording and mastering engineer, as well as a prolific contributor to a range of Internet listens, including ProAudio and Surround. I’ve followed his career for years now with consider able respect and admiration. 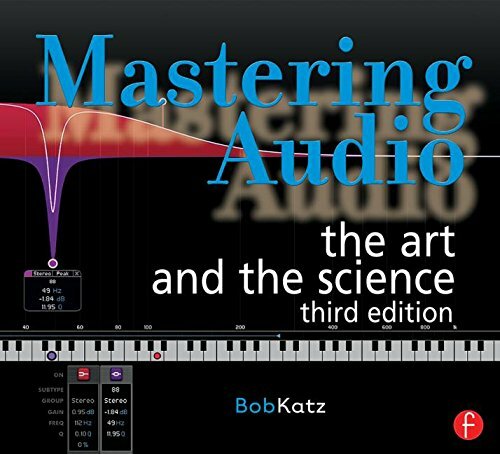 Bob’s new book, Mastering Audio: the art and the science (Focal Press) is a welcome addition to the small library of contemporary books about profession al audio. If you are a student of recordings, a budding recording engineer, or an audiophile who wishes to obtain an inside look into how recordings are made and mastered, this book is essential. It fills a hitherto unpopulated niche dealing with the final creative stage in mastering a modem recording. Beautifully printed and illustrated, Mastering Audio is divided into five parts. The first three cover the meat and potatoes of mastering, including facilities, formats, standards, preparation, the mastering process, signal processing, and the craft of mastering. Part IV is a very brief epilogue, and Part V is an excellent collection of Appendices, covering everything from the effects of radio broadcasting to a small but well-written glossary. There is also a good index. Part I: Preparation begins with the concepts related to mastering, a general philosophy of mastering, a welcome section on documentation, Bob’s take on possible DAWs and formats to choose and use, the processes and procedures used in mastering, and the librarian’s business of verification, archiving, and making back-ups (if you actively dislike the idea of becoming a librarian, don’t even think about be coming a mastering engineer!). This is followed by an extensive discussion of signal flow in the mastering suite, some excellent ear-training suggestions, and discussions of resolution, dither, levels management, dubbing, and monitoring—worthy and welcome topics, all. Part II: Mastering Techniques is worth the price of the book all by itself Beginning with a discussion of album assembly, Bob takes you through editing, levels adjustments, equalization, the use of compressors (should be required reading for everyone who ever makes an audio CD of anything), noise reduction, and other types of signal processing that find their way into the mastering room. Part III: Advanced Theory and Practice contains plenty of that, but also some material that is, to me, critical basics, not advanced at all. The first of these is a section about calibrated monitor systems. Second is a section on metering, including, of course, Bob’s own K-System of metering, which involves three different nominal levels choices. This section includes considerable discussion of the relationship of acoustic sound pressure levels to indicated meter levels and even touches on the growing issue of metadata, which is transmitted control data that is going to make our lives really complicated in a couple of years. A chapter on analog and digital processing takes you through that particular thicket of mythology and hype, including a discussion of some of the measuring tools that are available. Chapter 17 finally addresses some advanced “tricks of the trade,” and even detours out of mastering into plain old recording engineering to get at some important issues. There are also sections on sample rates, jitter, word clock issues, and, of course, a closing chapter on tips for getting out of the trouble we so often find ourselves in, right up to our ear-lobes! The remainder of the book, Part IV: Out of the Jungle and Part V: Appendices is a wrap-up, including some advice for those of you who would like to try this at home, some editorializing, and a closing poem by Bob, which is a nice touch, not to mention a gutsy inclusion. The Appendices are a grab-bag of excellent information, including file formats, tape and file prep, labeling and logging practices and templates, some decibel and level info, bandwidth/Q tables, digital speed and capacity info, more about Bob’s K-System, a bibliography of books and test CDs, and bios of Bob and his editor, Eric James, in addition to the previously mentioned radio info and glossary. So, there’s a lot here—a wealth of in- formation. Generally, I find it thorough, accurate, and up-to-date. On that basis, I believe this book should be an essential part of any audio professional’s or enthusiast’s library. However, I do have some quibbles to share with you, not to disparage the book, but rather to line your expectations for it up with what you’ll actually find when you buy it. You need to keep in mind that Bob is a mastering engineer by profession, not a teacher or a writer, and in his writing he tends to be hyper’ active, impatient, and intense. He wants to tell you everything at once, and he tends to throw himself into what it is he wishes to say. As a result, the writing style is a little herky-jerky and overly busy, which makes the book harder to read and to make sense pf than I would like. Lots of inserted “grabbers” and “audio myths” add to the clutter for me, and tend to break into the flow, rather than illuminating it. Too many acronyms also get in the way. Finally, Bob’s excellent and chatty footnotes are placed at the ends of chapters instead of the bottoms of pages, making them difficult and annoying to use. I often found myself wincing at places where perspective wasn’t clear, where teaching examples were missed, and where it was apparent to me that Bob sometimes is not particularly sensitive to (a) what confuses people and (b) what they’d really like to find out at any given point. An example: an early chapter called “Decibels for Dummies” is actually a fairly advanced discussion of digital levels management. There is hardly a mention of decibels at all, and no discussion of the basic principles of what decibels are or where they came from, what levels “mean,” or how we should think of them in a fundamental way. Instead, he dives straight into the deep end, starting with 0 dBFS, oversampling, normalization, and loudness. I found myself becoming uncomfortable (and I know this stuff!). I suspect many readers may find it daunting. My recommendation: keep the faith! Bob does get to decibels (if much later in the book). And yes, most of the explanations you will need are there, just not necessarily in the right learning order. It may take a bit of digging. Such a statement is a little more wordy, complex, and cautious, but it is also more meticulous (just like mastering has to be!) and more carefully de scribes the reality of the situation. Also, there is a missed opportunity here to discuss the politics of “what you tell clients” as opposed to “what you can prove in a test lab.” Be on the lookout! I didn’t find many outright errors or omissions in the book. The biggest problems I found in this regard were in the monitor calibration chapter (14). Bob makes the case that we need calibrated, known levels (which I absolutely and unequivocally agree with), but inexplicably fails to mention the primary reason for such a need, the Equal Loudness Contours (which illuminate the fact that as we change level we are also changing perceived spectrum, timbre, and equalization). There is also a minor misstatement here about the relationship between Sound Intensity (which is directly related to power) and Sound Pressure Level (which is derived from the square root of power). More important is some ambivalent editing and use of the term “monitor gain.” Bob correctly defines gain and monitor gain, but sometimes incorrectly uses it in the text, which is confusing. Finally, the process to be used for monitor calibration is not described well, so it was difficult to follow (a) what monitor calibration is supposed to accomplish, (b) what you need to do in order to calibrate, and (c) why you need to do it. These are all minor bumps in a really nice road. Look, you may encounter some confusions as you read Mastering Audio, there will be parts that are less than entirely clear, and some of the layout and hyper-textual pace may annoy you. For all that, Bob’s discussions of compression and equalization are probably the best and most comprehensive I’ve ever read, and his worldview is powerful and relevant. As I’ve said earlier, if you’re interested in how recordings are made or how to make them, buy this book! Thanks for listening.